The Morton Place mural, located just west of Dodger Stadium in Echo Park, has succumbed from too much graffiti and is now getting the official whitewash, reports a Curbed reader who sends in the above pictures. And via text message: "Aztec themed murals whitewashed this AM on both sides of Morton Pl on west edge of Elysian Pk." Let's hope this new, sparkling white paint job will repel future taggers. 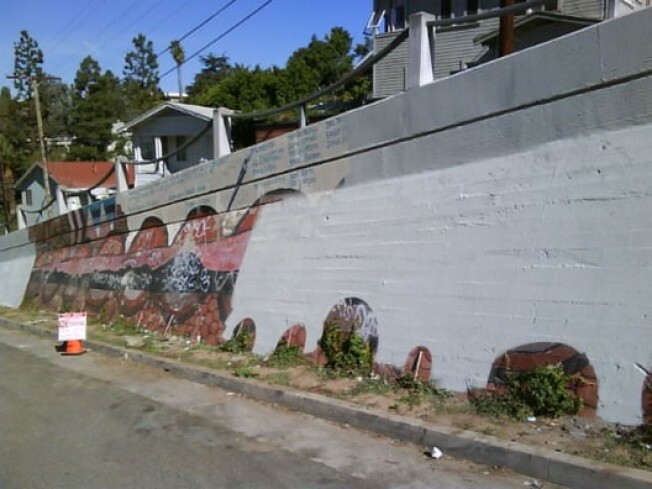 "Two long serpents are painted on embankment walls to either side of an Echo Park street. The mural has three different dedications at various places: "Dedicated to the City of Los Angeles from Rampart Youth and El Centro del Pueblo", "In Memory of Leonardo Diaz 5-27-73 9-23-94", and "This is dedicated to La Raza." It currently has a Mural Restoration Project going sponsored by El Centro del Pueblo. The mural was supervised by Diane M. Hernandez and Franciso Reyes. Artists lsited were Raymundo Rocky Avila, David & Rosa de la Riva, Diane Hernandez, Richard Torres, Rebecca Zamarripa, Monica Lutton, and Marina Ballesteros."